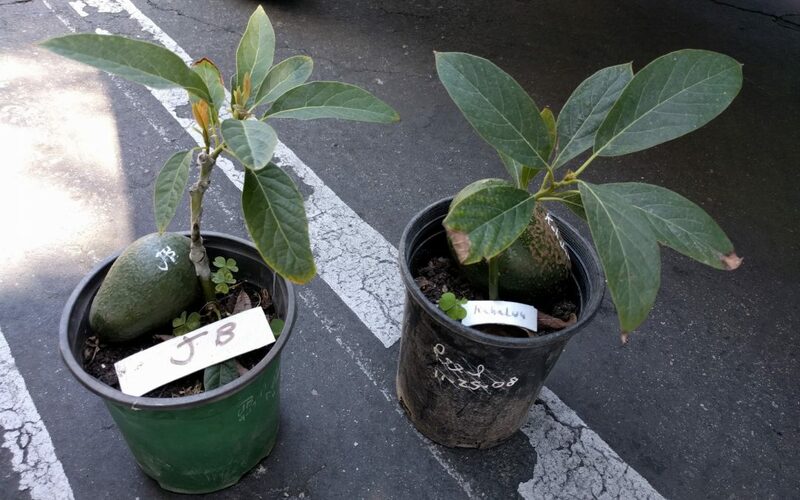 Even though I’ve planted many avocado trees, I was nervous putting in this little Jan Boyce, or JB for short (pictured on left). It is a particularly fine-tasting variety that I’d been trying to get my hands on for years. But I needn’t be too nervous. I’ve already made most every mistake there is when planting an avocado tree; I know what not to do anymore. 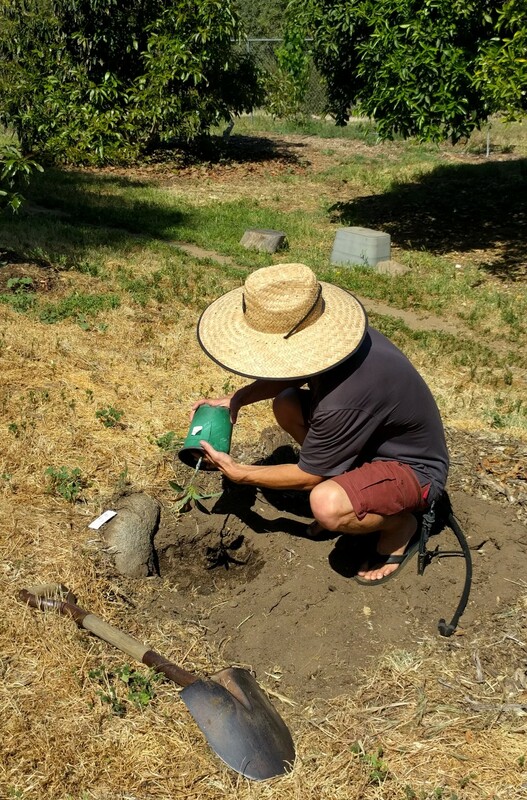 So here I write about how to plant an avocado tree with an eye toward avoiding common errors. 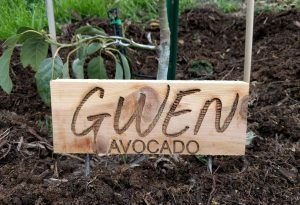 How fast water drains through the soil in your yard is a vital piece of information to know because avocado trees are unlike any other in that they have a very low tolerance for their roots remaining soggy. So what you should do before planting in a spot is test the drainage. You simply dig a hole about a foot deep and a foot wide, fill it with water and wait for it to disappear. Then fill it again and see how long it takes for the water to disappear this second time. A rule of thumb that many avocado experts have used over the years is that it must disappear in less than a day, 24 hours. But really, if it takes more than about eight hours I think you’re in the danger zone and you’re going to have to be careful not to water too often. Otherwise, your tree’s roots will rot, its leaves will turn yellow and droopy, and you’ll have wasted your time. It probably won’t be apparent right away. It might not reveal itself until the end of summer or until the tree’s first winter. Mounds can help. If your spot’s drainage is on the slow side, then build a mound of soil from 1-3 feet high and 4-7 feet wide and plant the tree in the top of it. You’ve essentially created an area of soil with better drainage for your tree. On the other hand, if you have fast-draining soil like me, where water drains out of the hole in less than an hour, then don’t bother planting on a high mound. If you did, you’d make it necessary to water even more frequently. In our case, plant level or only raised a few inches. 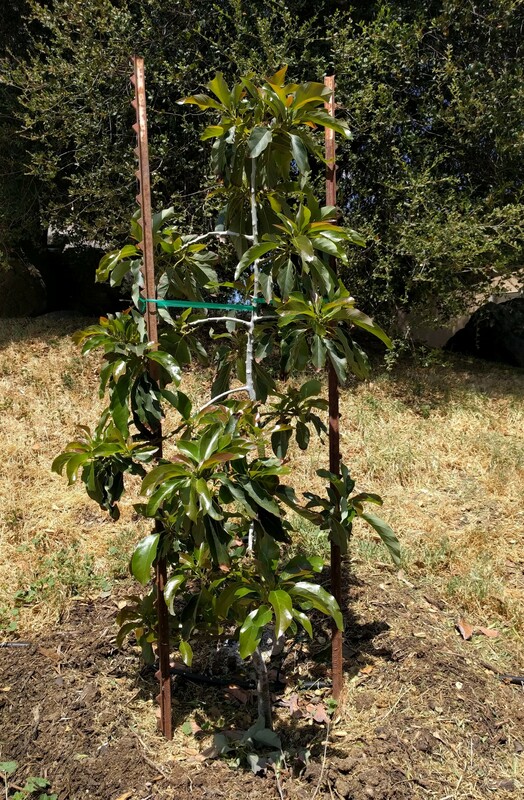 How to put an avocado tree into the ground? Dig a hole that is about twice as wide as the container. Do this so you can get your hands in the hole as you lower the tree and settle it in. There’s no need and no benefit of making the hole any wider. Also, dig the hole only as deep as the soil is in the container, no deeper. Don’t even dig the hole as deep as the rim of the container; only dig as deep as the soil within the container. If you dig deeper, you’re wasting energy at best. To get the tree out of the container there are different techniques according to the size of the container. A little one-gallon like my Jan Boyce is easy. You just squeeze the sides a bit to separate the plastic from the roots, then tip the container and slide the rootball out. Do this right next to the planting hole so you don’t have to carry it. Usually, the container mix is a loose mix and the avocado roots don’t hold it together well. The rootball tends to fall apart in your hands. So lower it right into the hole immediately. Avocado roots are brittle. They’re unlike other fruit tree roots. Still, if any are circling around the outside of the container mix, then very gently loosen them. They break easily, but do your best to loosen them a bit. This way they’ll extend out into the native soil from the very beginning and give the tree a larger soil volume to access. The most common size of avocado tree that we home gardeners buy in nurseries is sold in what’s called a five-gallon container. The process is the same as for my little one-gallon container, but everything is heavier and more awkward. It can help to have a partner when sliding the container off the tree’s rootball. At this point, put some of the dirt from the hole back in around the sides of the tree’s rootball, but only about half way. Then fill the moat with water. After it drains, tamp it down with your fingers to get air pockets out and settle the soil around the roots. Then fill the hole with dirt up to the level of the tree’s container mix, but don’t cover the container mix with dirt. If you do, it will be hard to get water through the dirt and into the container mix where the tree’s roots are. I like to build up a berm a few inches high around the new tree now. I make it a foot or two wider than the container was, and I add mulch. The berm isn’t necessary, but it makes it really easy to water in the tree right here after planting, which is necessary. You want to water a lot on planting day. 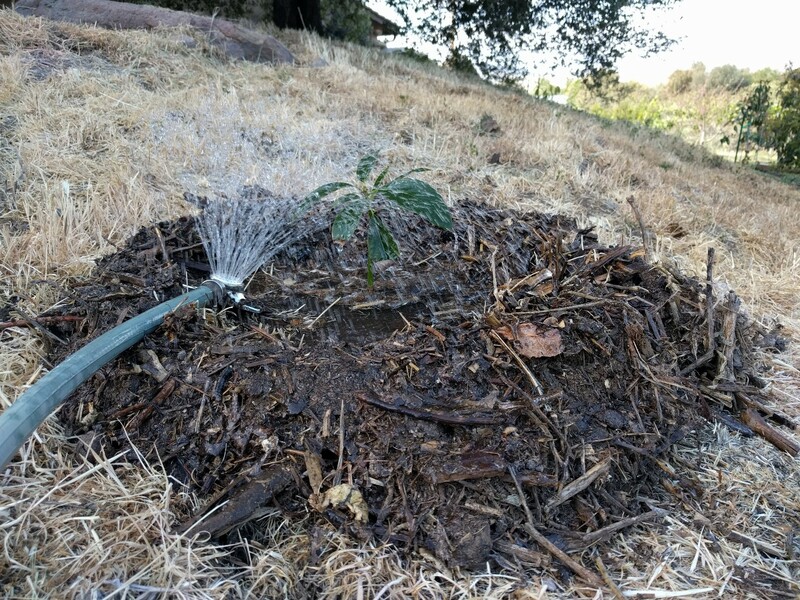 Along with testing the drainage, watering lavishly on planting day is the second very important thing you can do for your new avocado tree. I fill up the basin, let it drain, and fill it up another couple times in order to soak and settle the planting area. You could also accomplish this watering with a sprinkler. My little Jan Boyce didn’t come with a stake and it doesn’t need a stake. But if you bought a five- or 15-gallon tree, there will be a stake tied to it. You cannot remove this stake and expect your tree to stand up on its own, nor can you leave the stake as is and expect the tree to grow a strong and healthy trunk. I’ll call this the third key to getting an avocado tree off to the best possible start to life in your yard. The stake that is tied to your new avocado tree is a cast. It supports the trunk, but it also prevents the trunk from strengthening. The trunk can only strengthen if it is able to flex. You want to tie the trunk to the stakes as low as you can without the trunk flopping over. If the trunk is already fairly strong, you’ll be able to tie relatively low. But if the trunk is weak, you’ll have to tie higher or even possibly tie at two levels. Every month or so, check up on your stake ties to see that they’re still holding the tree up correctly. Often they need adjusting. 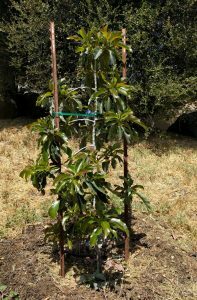 A young Nimlioh avocado tree with two stakes. Avocado farmers usually use a slightly different method. They replace the nursery stake with a thicker, taller single stake (2″ x 2″ wood or metal pole), and the tree is tied to that. This staking method also works. 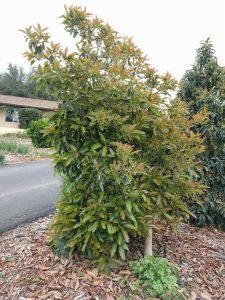 In addition to staking, you may need to do a little pruning over the first year or two in order to balance the tree’s growth and help it stand alone. I pruned some of the floppy top off this young Pinkerton tree, and it is now sturdy. On the other hand, I was too timid to do much early pruning with the Lamb tree shown below. It is no longer staked but it continues to lean even now at five years old. A tour with Julie Frink and Tom Spellman through the University of California’s amazing avocado germplasm collection in Irvine. See a mature Jan Boyce tree, plus many other rare and common varieties. It makes me want to plant an avocado tree!!! Thanks. Where did you get your one gallon Jan Boyce ? Thanks! 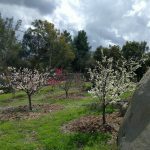 At “Green Scene” at the Fullerton Arboretum in Orange County. Julie Frink and other members of the California Rare Fruit Growers sell such uncommon fruit trees there. It’s a gardening event that happens once a year in the spring. 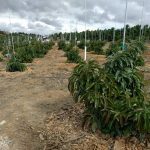 If you’re interested in getting an uncommon avocado variety like Jan Boyce now, you might look at Atkins Nursery or Subtropica Nursery or Paragon Tropicals. (Contact information in my post “Where to buy an avocado tree,” linked above). I am looking to plant two trees on a slope, but the slope is decently steep. I know I shouldn’t create a ledge or anything that would allow the water to pool. What is the best method for planting two trees so that the roots have room to grow, and water will absorb effectively but not pool? Thanks in advance for all the great information! My entire yard is sloped to varying degrees, and so was my previous yard. I’ve made all the mistakes you can when planting avocados on a slope, I think. Assuming your drainage is good (see the test above), then you probably do want to make a sort of mini-ledge initially. 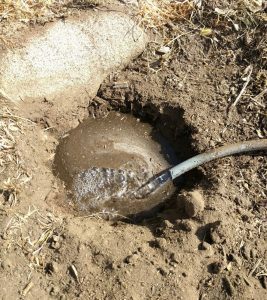 This will keep the water from running off down the hill as you water by hand on planting day and through the first couple weeks. I just build a half-moon shaped lip to act as a berm in this way on a slope. Alternatively, you can water with a dripper or micro-sprayer from the get-go and never need to build that ledge. But you’ll have to be careful not to have run-off, as well as water long enough to wet the soil completely to a depth of at least two feet deep, as well as a couple feet wider than the tree’s rootball. But before the ledge-or-not-ledge step, you’ll want to be sure to set the tree into the slope at grade. That is, don’t plant high. 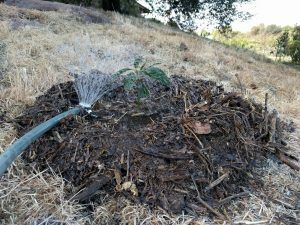 It’s very hard to keep a new tree watered if it’s planted high plus on a steep slope. You can do it, but it’s tricky. If your drainage is good, there’s no need to plant high on a slope. When winter rolls around, and the rains arrive, you’ll want to break the lip of that ledge down (if you’ve built one). That is the time you’ll need to be aware of water pooling because you won’t be in control of how much you water — as you are during the dry months. 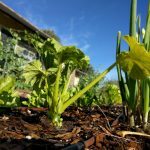 Just knock the lip of the ledge down and then be sure to mulch on top, and you shouldn’t have any problem with run-off or erosion while also not having pooling. I just purchased a reed and a Hass. I am planning on planting on a slope as mentioned above. I was wondering what your thoughts are on using deep watering stakes. My plan is to use your recommended micro sprayer for the bulk of the watering, but I thought that it may be smart to have a few deep watering stakes near the tree for deeper watering every now and then. Your intuition is good, but I think your trees will do better if you occasionally water them deeply with the micro-sprinklers rather than stakes. You can accomplish this by simply running the sprinklers for extra time. Just yesterday I saw a Fuerte tree that has been watered with three of those stakes for the past couple years and it’s doing poorly compared to a Hass right by it that is watered with sprinklers. Avocados just don’t seem to like that style of watering very much over the long term. As always thank you for the insight! My only concern is that it gets difficult to deeply water on the steep slope, but I think I can work on the micro sprinkler settings to get it right! I think you can too, especially if there’s a thick layer of coarse mulch under the tree. 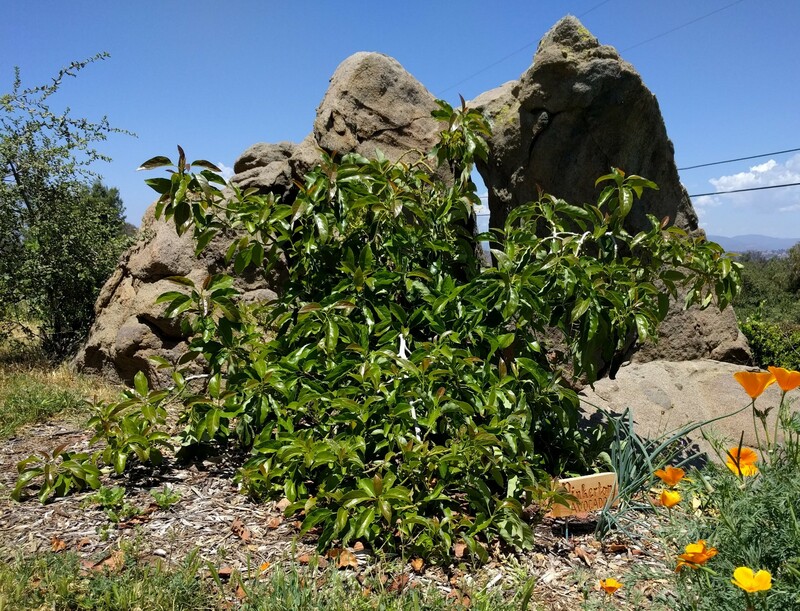 Just discovered your website, and like many others, have made many mistakes and killed multiple avocado trees by overwatering, combined with clay soil and a moat/well to pool water leading to root rot. Thank you for your detailed explanations and “how to” guides on so many home garden subjects that we are attempting. Thanks to your guidance, success is in our future!! Quick question. We live in Palos Verdes, south of LAX, and wondered if you know of a good nursery closer than San Diego area, that carries the Reed and Fuerte varieties of avocado? Thanks again for all your sharing and info! Tim V.
Thank you very much for the feedback. It’s encouraging to hear that my efforts here are valuable to you. 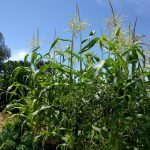 Reed and Fuerte avocado trees should not be difficult for you to find near Palos Verdes. I don’t know the retail nurseries near you, but I do know that there’s an Armstrong in Long Beach, as well as one in Torrance. They can get both of these trees for you if they don’t already have them in stock. You can also ask at any other nursery near you that carries avocado trees to order a Reed and Fuerte. The large wholesale growers which supply them (such as La Verne) grow these varieties so this should be possible. Let me know if you run into any further problems getting these trees. hi Greg, many thanks for your info. I have a 3 feet high avocado Haas on a pot inside an apartment, Im starting to doubt if I can keep it cause its getting big. About a month ago it started to get brown tips on a few leaves, seems maybe ive been underwatering it? have not been giving it too much water as I am afraid of root rot. Any tips? If your pot has plenty of holes on the bottom and you’re using a fast-draining mix inside the pot, then it’s highly unlikely you can induce any root rot infection in your tree. Don’t be afraid to water it often, especially if it’s in a sunny window and the humidity in your apartment is low because you’re using a heater, for example. If the tree is getting too big, you won’t hurt it by cutting it back. You can even just pinch off the terminal buds and it will grow bushier rather than taller. I just finished transplanting a 15g Hass and it came tied to a wooden pole. After cutting the ties I was shocked just how weak and floppy the tree was. Going to stake it properly but I had to tie it back to the pole quickly for fear it would literally flop a u-turn and break in half. Tree is about 5′ tall. That’s a good point. The process I follow is cutting off the ties to the original stake in order to see how the tree flops, but being prepared to handle it so it doesn’t snap in half. But I don’t remove the original stake yet. I tie it back to that original stake while I tie it to the new stake(s) in the proper place. Once the tree is supported by the new stake(s), then I remove the tie to the original stake and I remove the original stake. Hi Greg, I have a question about staking a container pomelo tree. I bought it from the nursery and it came in a 11″ pot. The stake is in the middle and I’m wondering if I need to restake it? I’ll put the tree outside when the weather gets warmer. I live in Toronto. Thank you for your help in advance! I love that you’re growing a pomelo in Toronto! It so happens that five months ago I planted a small mandarin that was tied to a single stake in the middle like your pomelo. I untied it to see how well it could stand up, decided that it did still need a little support, and so retied it in one spot to the same stake. No restaking. I just walked out to check the tree. I untied it and it’s already strong enough to not need the stake anymore. Citrus are much stronger than avocados in this way. Most likely, you can do as I did with this mandarin and will not need to do any restaking. Good luck this spring and summer!